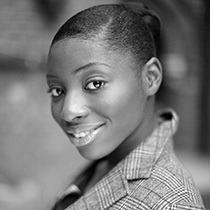 Iyin has been part of The Reapers Choir from the age of 14 and is a soprano. Her love for gospel music was a reason for joining, however, upon joining she gained an insight into what true ministration is. This led her to truly desire worship and helped her overcome fear of leading worship. In addition, being part of the choir enabled her to refine her voice and increase her vocal range. She seeks to be a genuine worshipper, not just through song, but in every aspect of her life. Her primary desire for the Reapers Choir is that they will be a light in this world of darkness.